I neither like or drink coffee, and would never even consider going to a Starbucks because, among other reasons, I detest overbearing chain franchises. I would never consider including any of them in my books when there are far better local alternatives. Argentina in general, and Buenos Aires in particular, would seem unlikely destinations for the world's most notorious espresso pusher, if only because espresso is the default choice for Argentine caffeine junkies at any corner café – even in small provincial towns. In Chile, where semi-soluble Nescafe was the only option for decades, espresso drinks are still relatively hard to come by (though Starbucks has a growing Santiago presence). 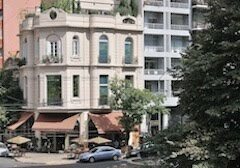 Nevertheless, Starbucks – with tentative plans to open about 20 locales per year in Argentina - has made news the last few days. First, it issued an apology (as shown in in the screen shot above) to its Argentine patrons that it could not serve their lattes and other espresso drinks in their brand name cups because of domestic trade secretary Guillermo Moreno’s capricious import restrictions. Consequently, the company had to serve them in generic, locally produced containers, and publicly apologized for having to do so. Presumably, the coffee tastes the same, and I don’t have a lot of sympathy with Starbucks or any other chain that goes out of its way to emphasize the corporate uniformity of products that are probably inferior (my wife, and other coffee drinkers I know, prefer local outlets such as Peet’s here in the Bay Area). 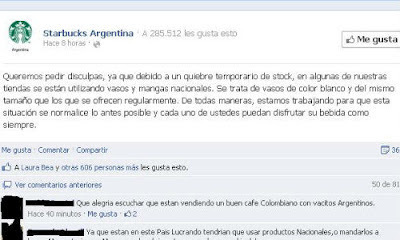 Starbucks’ Argentine apology fell on unreceptive ears, though, and it soon had to issue a second apology for having implied that locally produced containers were of inferior quality. Certainly, the manufacture of Starbucks-logo containers is not equivalent to producing iPads, iPhones or other high-tech products for which Argentina lacks the technological infrastructure – in principle, at least, it’s doable. Whether it’s doable in the context of an economy with 30 percent inflation and consequent high production costs is another question entirely (it’s probably cheaper to import them). One would hope that government officials would rather see the company devote its investment resources to opening additional branches that would employ larger numbers of Argentines. 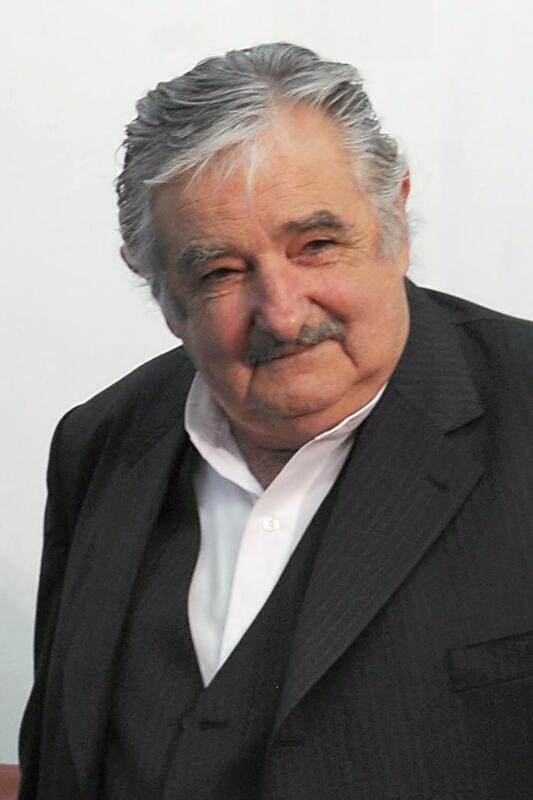 A few weeks ago, Uruguayan president José “Pepe” Mujica (pictured above) proposed legalization of marijuana as a state-run monopoly, but he has recently backtracked. The original idea was to provide legally grown weed for the country’s estimated 150,000 regular users (out of a population of 3.5 million). Lest the country become a destination for stoners, Mujica emphasized that only registered Uruguayan citizens would have access, and that they would have to register for rehab. Opinion within and beyond the government has been mixed, and Mujica finally declared that “If 60 percent of the country does not support us, we are abandoning the initiative.” How the government will determine that degree of support – through a plebiscite or otherwise – apparently remains undetermined. The whole Starbucks thing (and I don't frequent them because I simply don't like their coffee) is a tempest in a coffee cup. First off, note that nowhere in their Tweet does it say anything about the import restrictions. That was made up whole cloth by various bloggers and tweeters who jumped on the whole thing, one side or the other of the argument and turned it into something political, and a way to attack either the company or the government. Starbucks followed up by tweeting that it had nothing to do with trade restrictions but was an internal planning error on their part. That, of course, has done nothing to cool the ire of the folk who want to make it into a cause célèbre. Thanks for the comment, Dan. The story is still plausible to me, but I'm guessing that the company might want to avoid making things worse for themselves.